The camera has an increased image resolution and the body is wider and thinner. This camera may produce excellent images, but it doesn't come across as built to last. The five-megapixel Lumix DMC-LS2 replaces the DMC-LS1 in Panasonic's range of mid-level compacts, and brings much-needed updates to the budget model. A brush of style has come into the design with the camera body taking a wider, thinner look, plus it has increased image resolution and an abundance of features. MEGA OIS (optical image stabiliser) is a stability feature Panasonic has developed to counter shaky hands, and it works particularly well on this camera when shooting video. We got clear video with no problems, and stored the lot on the camera's built-in memory, which is nice to have but a bit low at only 16MB. There are also two modes to OIS; one of which, Mode 2, is particularly useful as it only activates the image stabilising when the shutter button is pressed rather than throughout, saving battery life and targeting the main time when shakes are likely to occur. It's only a shame they added the 'MEGA' to the technology, as it deserves a less gimmicky-sounding moniker. 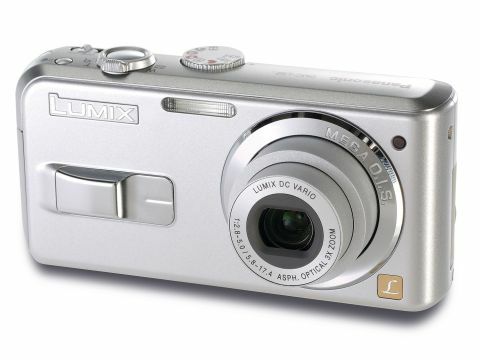 The image quality was generally excellent from this camera, producing sharp and clear shots with little noise. On the downside, compared to the strong builds on offer in other cameras in this test, the DMC-LS2 comes across as very light and a bit rickety. The side battery cover seems a prime candidate for jolting loose of its mounting somewhere down the line. The layout of the control buttons, including the menu scroll, are closely bunched, which took some getting used to. Another problem, although minor, was the battery life, which is only good for 250 shots from one set of fresh double AAs. It's not a bad camera for entry-level users, but the build gives us pause for thought, despite the great images.